Ski-O Training Camp will be arranged from Monday 9th to 12th of December in the World Cup terrains. There is an excellent opportunity to improve your Ski-O techique and skills after the World Cup in Ylläs. 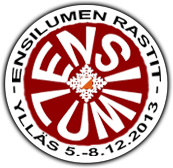 Local organizers together with the best Ski-O experts in Finland will offer you well prepared and demanding trainings. Previous World Champion Anssi Juutilainen is one of those responsible to arrange this training camp. Training maps will be sold in two places at Äkäslompolo Kellokas and at Ylläsjärvi / Iso-Ylläs Event Centre info building (near stadium). Maps are available every morning at 10 o’clock from Monday 9.12. to Thursday 12.12. with different types of training every day. The skiing track maps with all controls are also available on both map selling points. Ylläsjärvi Event Centre info will be open daily from 10 am to 11 am. Kellokas will be open 9 am to 16 pm.